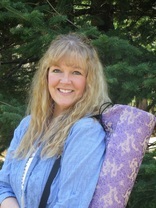 Joy has been a student of yoga since 1999. She came to yoga as a cross training activity for running, and quickly fell in love with the life changing philosophy and meditation studies offered at Yoga North in Duluth. She is in the process of completing her teacher trainer 500 advanced level. She has had the opportunity to travel to India twice to learn from some of the great masters in the Himalayan Tradition. In class, she enjoys blending somatics, classic asanas and ancient mantras, along with breathing techniques and relaxation.